Bulk .223 hollow points? Yes, please. Bulk .223 hollow point which aren’t steel cased? Where do I sign up? But that’s exactly what you are looking at here: 50 grain jacketed hollow points by renowned and trusted Federal’s American Eagle line of products. 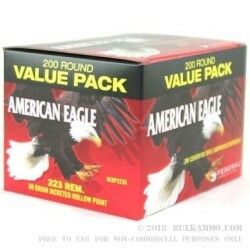 American Eagle is a well-known and respected line of brass cased ammunition produced by Federal Premium. This particular variety is a real screamer, blistering along at 3,325 fps at the muzzle. This 50 grain JHP is a dedicated varmint slayer and will do so with gusto producing numbers like that. American Eagle Varmint is a dedicated pest eradicator with no compromising. It is made light and fast with an excellent ballistic coefficient of 0.204 to ensure flat shooting for punching down varmints. If you find yourself in the position to have a large quantity of pest which require dispatching, buying your ammo in bulk is the only answer. There is nothing worse than being in a target rich environment with no resources at your disposal. 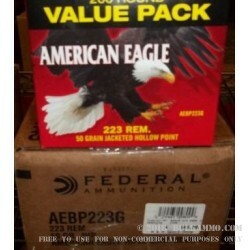 Be a Boy Scout here and Be Prepared; pick up a case of American Eagle 50 grain JHPs for your varmint problems today. Better yet, buy two cases just to be safe.